In reinforced concrete, steel is provided to strengthen it against tension force and in many cases compression forces too; it is used to counteract shear and torsion, but bond is not big deal in these cases. Do you think, just including steel within concrete render greater strength? There have five assumptions to act a section as reinforced concrete. We will discuss about one assumption that represents flexure bond strength. The assumption is in one word, strain in reinforcing bar embedded in concrete must be same as that of concrete. Hence, if one of them deforms other should follow in identical way. Why is bond force so significant? Or why should slip not be allowed? If a reinforced concrete flexural member (say beam) is reinforced by plain and round bars and additionally if bars are lubricates by grease or by any other materials before placing concrete, there would be little or no bond between two materials, and the resulting strength will be almost equal to that of plain concrete having no reinforcement [fig-1 (a)]. When load is applied on that member [fig-1 (b)], the reinforcement will try to keep their actual length when this beam is deflected. The bar will be slipped relative to adjacent concrete in longitudinal direction where concrete is subjected to tensile strain under flexure. Thus the assumption stated above will not followed. Thus to behave like reinforced concrete as expected, the bond forces must be developed on interface between two materials so that slip at this interfaces are prevented effectively or significantly. The bond forces generated in the interface of concrete must be equal and opposite to that generated on steel to prevent the slip between them. Above figure [fig-1(c) and fig-1(d)] describes the condition clearly. Does plain reinforcing bar not produce any bond forces? This type of reinforcement also provide some bond strength but of very weak. 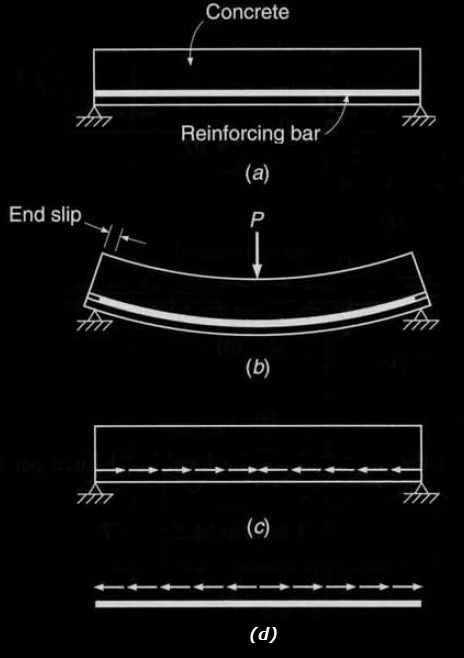 Plain bars having no surface deformations initially resist slip by chemical adhesion generated between them and chanical friction also offer some resistance in the interface of them. Every material has some natural roughness. When both chemical adhesion and mechanical friction are not enough to resist slip, a small slip make natural roughness to be active. The interlocking provided by this also result some resistance against slip. But this bond strength is also too low which lead to break down bond between concrete and steel in beams having plain reinforcing bars and this phenomenon is very common in that type of beams. These beams are collapse when the bars are pulled through surrounding concrete. Do you think we have missing anchorage by hooks or any type of mechanical anchorage? Anchorage provides an option to resist such type of failure but when serviceability is concerned, anchorage allow larger deflection in the member which lead to increase crack width. Again consider a beam reinforced with plain bars, when end anchorage is provided (most common is providing hooks) and assumed that anchorage is sufficient, the beam will not fail; surprisingly when entire length of bars between anchorage lose their bond, the member still survives without failure. The interesting fact is that the member here behaves as an arch tied at the anchorage point. The uncracked concrete between anchorage (as shown in fig-2) act as arch and anchored bars act as tie rod. Thus the bond force along the length where bond is broken, is zero and the portion of unbond steel has uniform tension force. Where jd is the lever arm between resultant of tension and compression forces. The total elongation of steel is this case will be larger than that of a beam having proper bond. Thus deflection in this beam will be more and crack width will be also more. Deformed bars are very common in recent construction practice which is successfully suppressing this situation. In this bars deformations are provided by ribs projecting from the surface of bars. This shoulders of ribs of bars bear on surrounding concrete which significantly increase bond strength. This deformed bar together with anchorage devices like hooks offers effective way to decrease deflection as well as cracks. By apply development length concept, providing sufficient embedment length full tensile strength of reinforcing bars are mobilized which is wither controlled by either splitting or pull out. Thanks for the wonderful information.Expando is Safe, environmentally friendly, and is a non explosive rock splitting and concrete cutting solution.